I am a Big Pine Resident and have been a home owner in Big Pine since 2004. It is my pleasure to sponsor this event at no cost to the participates however should you wish to make a donation it will be helpful in covering promotional costs. I am your local Real Estate Professional here to assist you with your real estate needs. Each house will display their goods in their front yard. Look for red, white, & blue directional signs. If you wish to add additional signs of your own to direct people to your house I encourage you to do so. Also if you wish to place an ad in the newspapers feel free to do so. 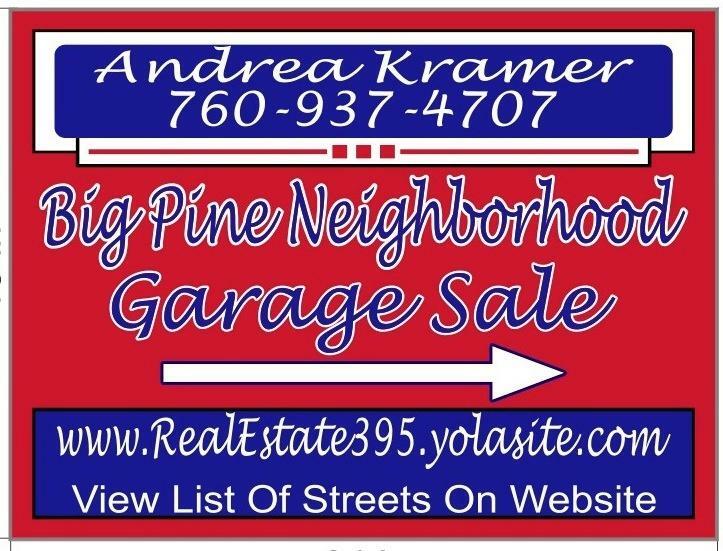 I will place an ad in the Inyo Register under the Yard Sale section and The Sierra Reader large ad was placed and the Yard Sale section. I will be asking Sierra Wave, KMMT and to mention the garage sale on the Radio. If you decide last minute to participate please call me so I may add your street.